Earlier this year I reviewed ACDSee Ultimate 10. However, ACDSee just released the 2018 version of their flagship photo editing software and thus it’s time for an update. The brand new iteration promises to offer a more efficient workflow, layered editing for advanced retouching, vastly improved performances, and new tools for photographers to edit their pictures better than ever. Let’s see how this translates in the real world! ACDSee Photo Studio Ultimate 2018 is quite a unique software. 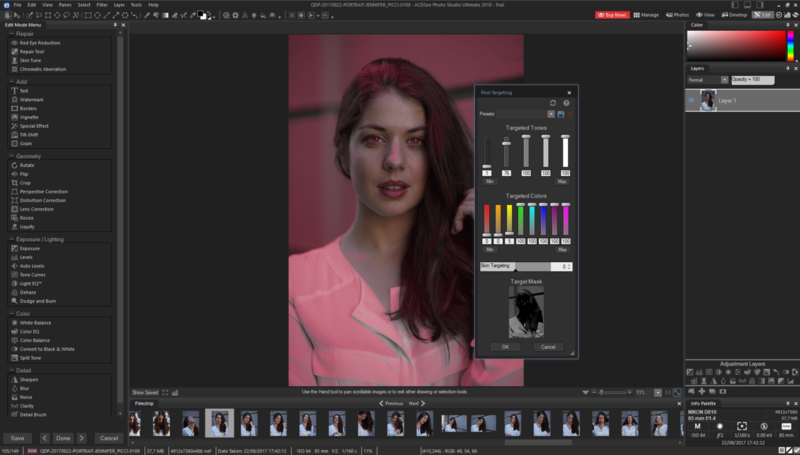 It could replace Adobe Lightroom or Capture One Pro, but it may just as well take the place of Affinity Photo or Adobe Photoshop. It’s something important to emphasize because it’s kind of a unique spec. A tool that can just as well manage your assets, process your raw files, automate editing, or allow you to retouch with layers is fantastic! It has the power of removing quite a few steps from your workflow and thus makes it easier and more efficient. Who hasn’t dreamed of a seamless workflow with no round-trip whatsoever? 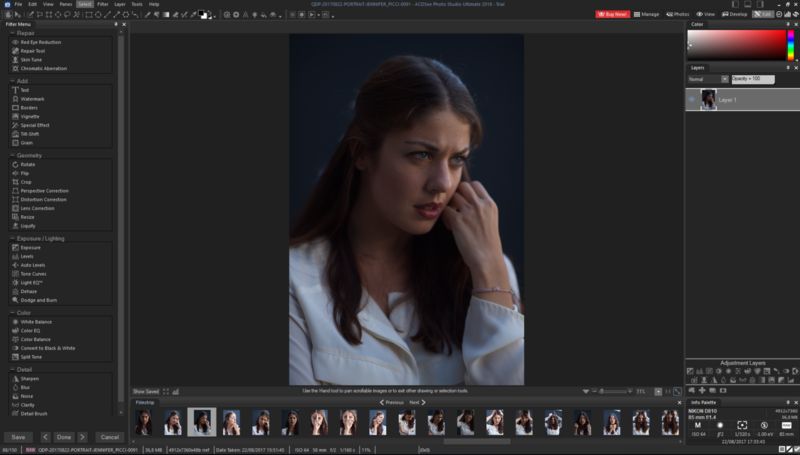 Similar to the previous edition, ACDSee Photo Studio Ultimate 2018's interface is split into different modules. When opening for the first time, you’ll land in the Manage module to start browsing your folder and images. You can import your pictures into the software, but it’s not a requirement, and you can start working on images as soon as you open the folder they are located in. No need to remember what catalog or session contains what files; simply open the photo editing app and get to work. The second module is called Photos and will let you go through all the images you’ve worked on in the software by date. If you have had an iPhone in your hand and opened the photos apps, you’ll know how that works and won’t be lost for a second. If you haven’t, you’ll pick it up very quickly! It may not sound useful at first, but when you work on tons of images, it’s often quite helpful to be able to go back in time and watch all of your pictures within one single view. Then comes View mode, which is particularly suited for those who want to cull their files quickly. Because it loads embedded JPEG from the raw files and not previews, your culling process will be much faster! No need to work with PhotoMechanic anymore before importing your shots. Finally, we come to the more interesting part, at least the one I like best: Edit and Develop. These are the next two tabs and modules in the app. Develop is meant to process your files in a non-destructive way, as you would within Lightroom or Capture One. It has everything both of these tools offer and even more! From local adjustments to snapshots and amazing options, such as Light EQ and Color EQ, you most likely won’t miss anything. And if you ever do, chances are you’ll find what you need in the Edit module, which covers pretty much what you could do in Photoshop. The way the Edit module is designed is a bit different than Photoshop, Gimp, or Affinity Photo, but it’s quite easy to learn and get the hang of it. I’d almost dare say it’s more intuitive than the other photo editing solutions. But so far, if you’ve read my previous review in May of this year, you probably notice there isn’t much change. Sure, there are a couple of things that are great and noticeable, such as the performances improvement, or being warned when importing files twice. However, what made me enjoy this 2018 release even more than the 10 is a few gems found in the Edit module. Luminosity masks are amongst the things that I use the most when retouching my images with Photoshop. However, there are tons of way to create them, and not all of them are accessible to beginners. I was thrilled to find a new tool called Pixel Targeting in ACDSee Photo Studio Ultimate 2018 Edit module. It’s a visual way to create a mask based on luminosity, color, or both of them combined. Thus, you can now select skin only very easily or tone down part of an image quickly too. Frequency separation, or split frequency, has been overhyped over the past few years, and, because of it, it has gotten a poor reputation when it comes to retouching. However, when it comes to fast retouching while retaining as much quality as possible, it’s a great option! Dodging and burning micro-contrast issues isn’t always possible due to either the quantity of work required or the deadline given by the client. With Ultimate 2018, the frequency separation technique is already built-in. In the Edit module, duplicate the base layer, right-click, and then select Frequency Separation. The software will create a low and high pass layer for you on which you can alter the texture from the rest. There are different methods to work on these, and I’ll get back to them in a future Ultimate 2018 portrait retouching tutorial. But so far, the built-in method works quite nicely. My only issue is not being able to choose the radius for the creation of both separation layers. For most users, it probably won’t be a problem, but for more refined work, it may be. For Photoshop users, the smart erase can compare to the healing brush, but also do the same job as the patch tool. It allows you to remove unwanted objects by recreating pixels from the surrounding area. A great addition for landscape photographers who want to eliminate people from their images or for portrait photographers to clean up zits and other skin issues. In Edit mode, you can now save time using actions combined with the Actions Browser. ACDSee Photo Studio Ultimate 2018 comes with over 125 actions pre-recorded that you can use on your images. They range from color grading to sharpening, and even adding special effects, such as borders or a tilt-shift effect. Actions are great; I use them all the time in Photoshop, the same way I use presets in Capture One. However, having a clear browser with an instant preview is a time-saver. It’s a lot more efficient! Priced at $149.99 for a lifetime license, it’s a great alternative to any other combination of photo editing tools. 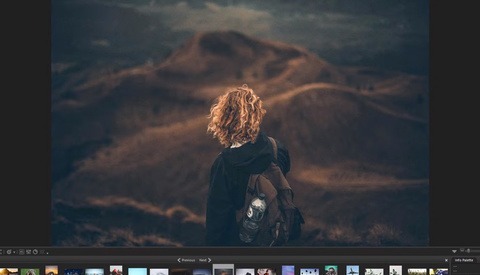 It could replace Photo Mechanic for fast culling, Lightroom or Capture One for raw processing and digital asset management, and then even Photoshop for those who don’t need all the fancy features that most photographers never use anyway. Like I mentioned in the previous review, wedding photographers and people who work with high volumes of images will probably enjoy the ACDSee solution the most. Not having to round-trip between different tools, and being able to work on a NAS without performance issues, is fantastic! If you are just not sure it’s the perfect solution for you, be sure to download the free trial version and give it a try. ACDSee Ultimate 10 was great, but the 2018 release is even better. The very few tools I wish could have been included in the previous version have been added, and the performance has been improved. My only wish is for ACDSee to release their MacOS version soon. It would place them as a very attractive alternative to Adobe solutions for photographers. For now, Windows users can enjoy a robust solution that is specifically tailored for photographers and not visual artists in general. Very Nice, this appears to be a great substitute for LR/PS. I'm definitely going to try ACDSee Ultimate once they get a MacOS version completed and feature equivalent to this Win. based release. I'll *never* support any Adobe subscription model (currently using stand alone LR6+PS Elements). no DNG support. that alone is enough for me to not use it. I didn't read that. I just noticed that it would just ignore my DNG's and refuse to open them. "When editing layered TIFF or PSD files, the layers aren’t preserved" Does that mean it doesn't have layers or doesn't support layers created in Photoshop? Are you really serious about this? I've been a ACDSee customer for a number of years and a few months ago I couldn't stand anymore the burden that this humongous piece of software became and finally abandoned it. Lightroom is definitely sufficient and superior in all the areas truly matter. ACD is too heavy and instable in my well maintained windows 10 x64. Had to make several trial and error sessions of uninstall-reinstall between new and old versions just to get things going on in a minimal acceptable way. ACDsee was excellent when Windows95 was king; not anymore. They should lower the price and release a free community version. Then they would win my respect again. This is sponsored article, take it with grain of salt. Was it? Were is the disclaimer? Heretofore I believed fstoppers.com to be a transparent source of content. From now on I shall be more attentive - with a salt shaker at my side. I'm a current ACDSee Ultimate 10 user and I got my first crash the other night when working with a number of layers. They do keep adding more things (like the Liquify tool in the new 2018) but I'm starting to wonder if paying the upgrade price every 4-6 months to get the latest tool (that's already in PS) is really a better choice than the Adobe subscription model. I'm a hobbyist, so it's not like I'm using it every day. I would try it if it had tethered shooting mode. The only think what I liked about this app in old times, was the ability to import entire images that are stored on the computer very quickly. Hope it does it that way again. Take that one further brother! I'd love to see 802.11ac WIFI tether take root. No need for cables at that bandwidth. Sad it only exists as a $600 dongle on flagship $6k bodies, meanwhile my $400 cell phone does it. Can it do panorama and HDR like lightroom? As a current ACDSee Ultimate 10 user, the answer is no. Links in their support/community go to an article about "HDR in one image" that basically has to do with using curves, as I recall. Sounds great, but I'd need a MacOS version and even better, an iOS version. I've moved most of my editing over to Affinity Photo on iOS and the only thing i'm missing is the DAM and color balance portion of Capture One. Oh, and the Luma curve. DAM is coming soon and I've pretty much used workarounds for the others. If you need your editing software on multiple devices, Adobe is cheaper as it allows installation on up to 3 devices. ACDSee requires a separate license for each device. I thought Adobe only allowed 2 devices. I use ACDSee Pro 10 for culling. I've been an ACDSee user since version 2, and I wouldn't rely on it for all of my editing needs, it's too unstable for that. As an alternative to Photo Mechanic it is pretty incredible for the price. Tried that product but the Develop and Edit modules went belly up with X-T2 RAF files (Raw files). The pictures are suddenly replaced with white screen. Works fine with NEF. Not sure where the benefits of having separated Develop and Edit modules are. I'll stick with LR/PS at this time. I really wish reviewers would say right at the beginning when a software product runs on only one platform. Why is it that reviewers of Windows-only software don't mention this giant limitation until the very end, if they bother at all? Really annoying for a Mac user to read a glowing review and then find out it's not for them. Please, state "Windows-only" right at the start! I used to use ACDSee a long time ago, I liked it, but with the advent of LR, I find that ACDSee isn't really as useful, though still easier to use, probably. I'm not at all enamored with the subscription model, but I've given in for now. The one thing that made me just say no, after reading this review is "When editing layered TIFF or PSD files, the layers aren’t preserved" -- Nope. That's ridiculous, can't handle that, I want to keep the edits I have made, and not automatically flatten the file if I access it in ACDSee. Wait a second, this is a "sponsored" article. Oh. F-that. And to not be completely transparent about it, is BS. Bad move Fstoppers. When it comes to photo management, this has been one of the best and still is. I'm glad they've constantly integrated new features, like the Smart Erase filter or the Liquify filter, which are really useful in many situations. As far as batch processing goes, I still prefer BatchPhoto over ACDSee or Lightroom. Those guys just make it really simple to watermark or resize or date stamp multiple photos at once.